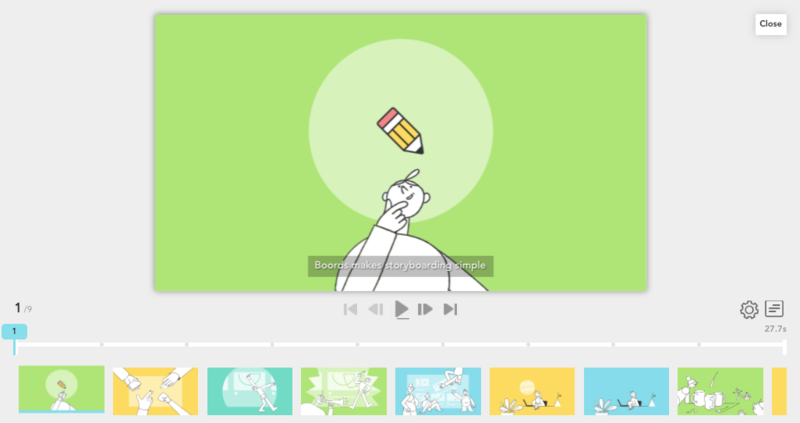 We're so excited to introduce the new Animatic Tool. 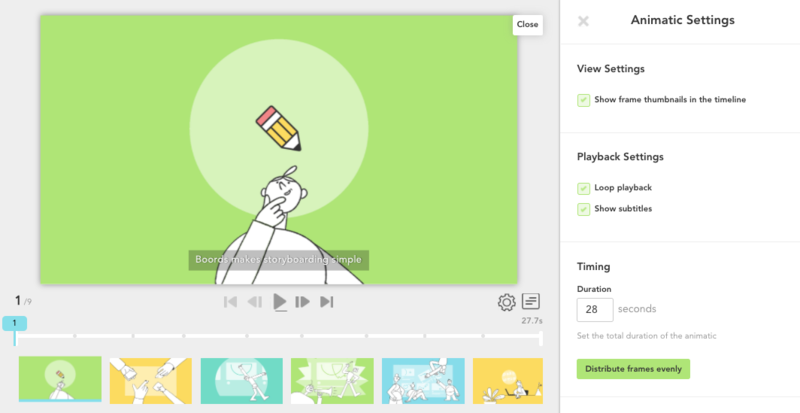 Creating, editing and sharing animatics is now a breeze. 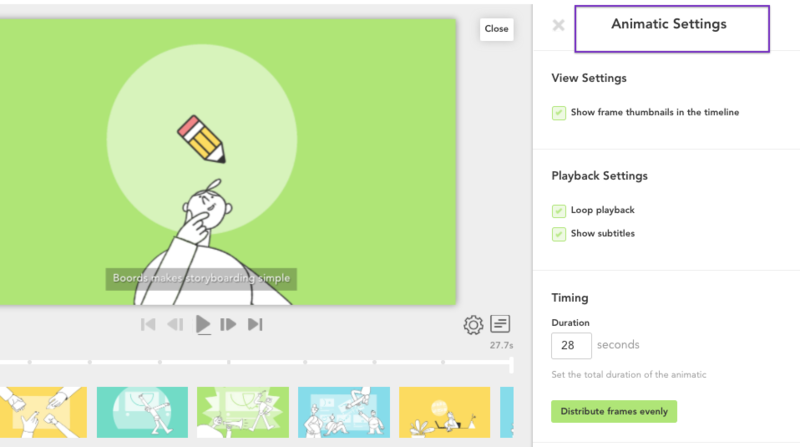 The Animatic Tool is designed to allow you to edit the timings of your frames, add sound files and share work with your team and/or clients. Here, we'll give you a rundown on the Animatic Tool's features and help you get started with creating your animatics. Check out the video below to see it in action or read ahead for the step-by-step guide. 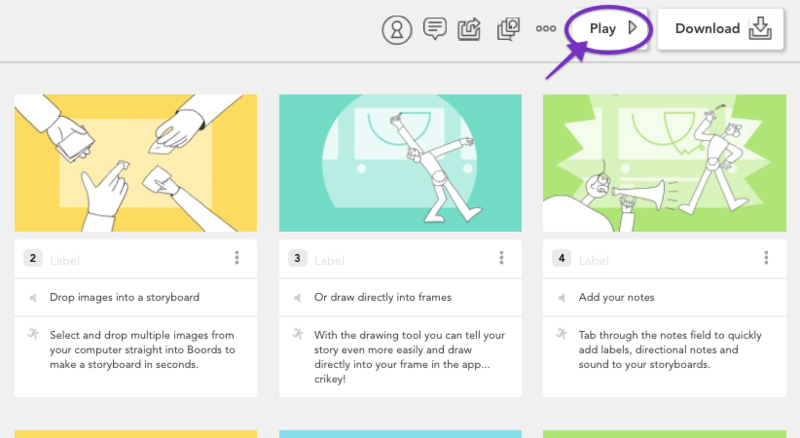 First things first, open the storyboard that you want to work on and click the "Play" button. Head to the Settings area by clicking the "Show settings" icon in the bottom right-hand corner. In the panel that opens on the right, you can customise exactly how you want your animatic to look and behave. If you're not planning on syncing your frames to a sound file, you can specify the total length of your animatic in the settings panel. Position the timings of the frames across the duration of the animatic by holding down shift and dragging the frame markers. Or, you can set your frame timings to an even distribution across the duration of the animatic by clicking "Distribute frames evenly" in the settings panel. 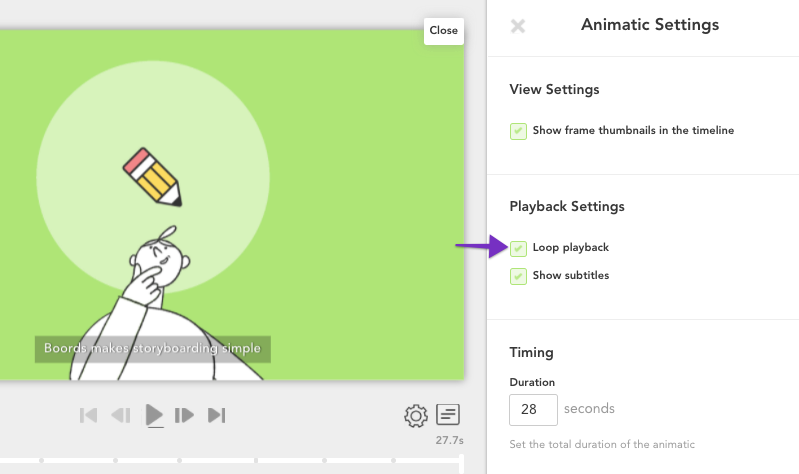 Make sure to check the "Loop playback" box if you want the animatic to loop, rather than stop at the end of playback. If you'd like to add your own sound file, upload it directly from your device by clicking "Choose File" in the settings panel. 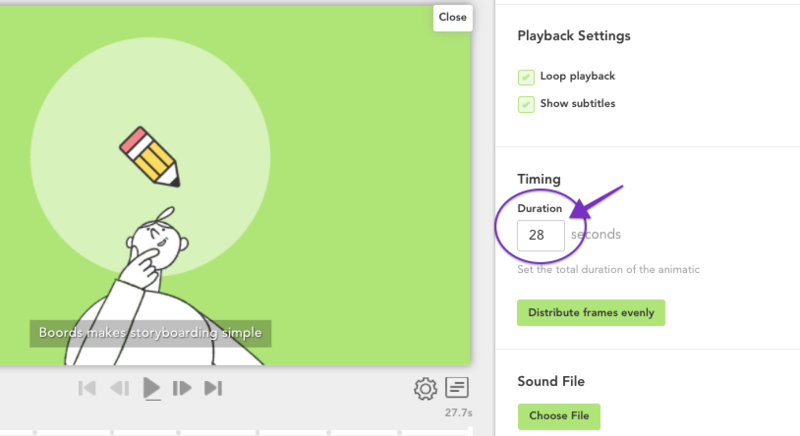 The duration of your animatic will be set by the duration of the uploaded sound file. Both WAV and MP4 files are supported in the Player and have a maximum file size of 20MB. Once you've uploaded your sound file, use the waveform to help sync the audio to your frames. Turning the subtitles on will also help in syncing the frames to the audio. This will display the sound notes associated with each frame as an overlay on the playback. To turn the subtitles on, check the "Show subtitles" box in the settings panel. A thumbnail preview for each frame can be shown or hidden by checking the "Show frame thumbnails in the timeline" box. 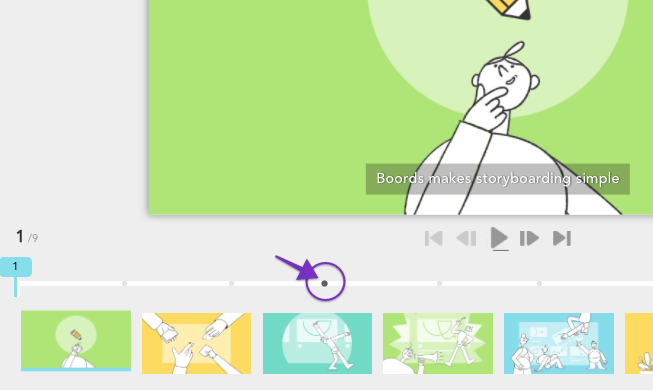 Displaying the thumbnails allows for quick and easy navigation through the frames of your storyboard. The current frame is highlighted with a blue underline. 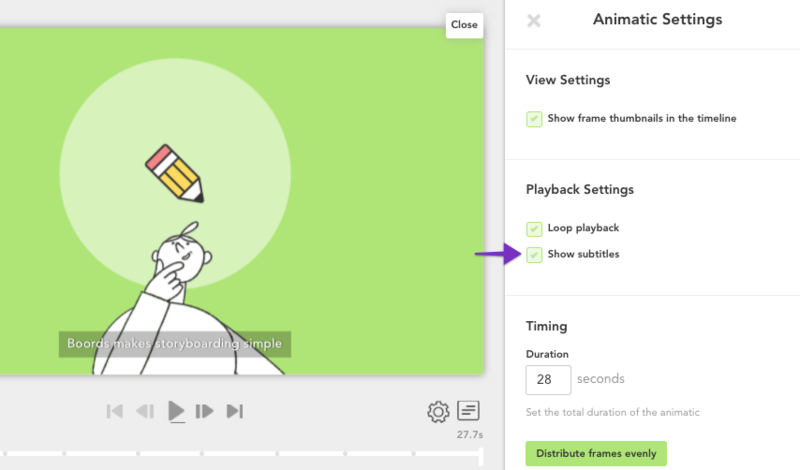 When you've finished your animatic and are ready for feedback, you can share your work through the sharable link or by rendering the Animatic to an MP4 file. 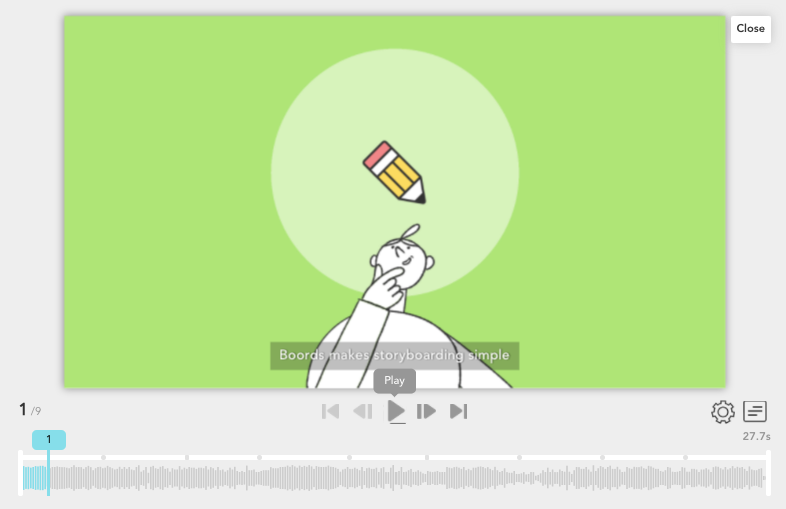 There you have it, the Boords Animatic Tool! As always, we'd love to hear your thoughts and any feedback you have is welcomed with open arms. Send us a direct message from within the app by clicking on the chat bubble in the lower right-hand corner. If you haven't already, make sure to join the Boords community in our Facebook group, The Boords Room, to stay in the loop with all of the latest animatic developments.